Our Institute Artists are amazing musicians and we want to share their personal stories , musical insights, and passion for performance with you, so we asked each artist to answer some questions about what it is like to be a performing musician. 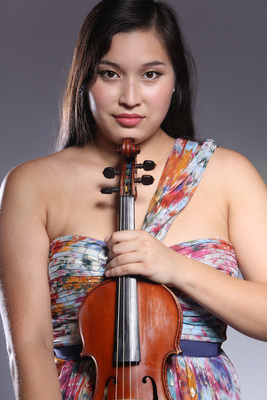 We hope you enjoy getting to know one of the violinists from the Ulysses Quartet, Christina Bouey. Why or when did you start learning music? Is your family musical? These two questions go hand in hand for me. Both of my parents are classical singers, and my sister studied classical voice growing up and quickly found her love for musical theatre. My parents found me playing Ode to Joy by ear on the piano when I was 2 years old. After that, they continued to help develop my musical skills. I played piano for fun since I was 2 but didn't study seriously until I was 9. The instrument I was always drawn to was violin! I saw Sarah Chang on t.v.when I was 5 years old and I told my parents, "get me one and I'll do the same thing!" At the time they could not afford one, but lucky for me, we moved to Prince Edward Island a few years later and I was able to start violin in elementary school group lessons when I was 9. I started private lessons shortly after. Nineteen years later, here I am still loving the violin and I added onto my musical family by marrying a trumpet player! What instrument do you play and why do you continue to play it? I play on a beautiful Stefano Scarampella from 1900. It is a beautiful Italian violin and is on loan from the Canada Council Instrument Bank. I am so thankful to have this opportunity to be playing my dream instrument. If you could meet anyone in the history of music, who would it be? What would you ask them? There are so many musicians I would have loved to meet but if I can only choose one, it would have to be Beethoven! He knew how to write the most heartfelt melodies and harmonies that fill me to the brim with emotion. It's hard to describe but he makes you feel like everything will be ok with his music. There are many questions I would ask him, but even more interesting, to me, is the ability to spend time with him, and see how he lived his life. He was supposedly very dedicated to his craft, and for him to be able to write music that beautifully after he went deaf is a testament to how great he really was. It's incredibly inspiring to me. If you could perform with any musician from any time, who would it be? Why? I would have loved to play some duets with David Oistrakh, one of my favorite violinists of all time. I think we would have had a lot of fun making music together and I find my sound and musical ideas similar to how Oistrakh played.